G13 Labs - Blueberry Gum. Free US delivery. 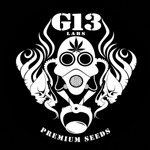 Blueberry Gum - the latest in G13 line of awesome Strains! A strain that will clear your mind but also give you an earthly calm. This strain is a must have for every connoisseur. Low maintenance and mould resistant make it perfect for amateurs but has the taste that would satisfy even the most fastidious and hard to please connoisseurs. Blueberry Gum produces rock solid crystal nugs with a sweet bubblegum aroma. Take our word this will knock your sock off!